The work of Lew French takes viewers and property owners to new levels of creative ideas. 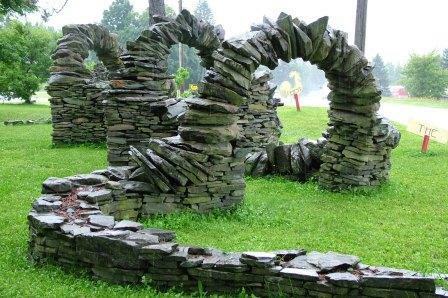 His stone work has become famous throughout the world. For interesting local Stowe, VT stone work check out these local stone workers and landscape artists. Looking for landscaping ideas that are state of the art and work within the naturally surrounding environment contact Ian Ambler, a long time family friend. You can reach Ian at Ambler Design. For local stone workers who are bringing stone work to the next level check out Thea Alvin who owns My Earth Work. Thea is bending stone as if it were water. Also contact Matthew Karlin of Matthew Karlin Masonry who laid the majority of the stone work at the new Stowe Mountain Resort. Matt can be reached at 802-363-5019, tell him fellow Brew Crew ski bum member McKee sent you his way. Read more about Lew French's designs by clicking below. Rocks Star | New England Home. Attractive component of content. I simply stumbled upon your web site and in accession capital to claim that I get in fact enjoyed account your weblog posts. Anyway I will be subscribing in your feeds and even I fulfillment you access persistently fast. You have to choose the right materials for your spring landscaping. This seasonal garden glimpse is just one of many several landscaping concepts that you simply can check out. Are you looking to buy a rainwater tank in Adelaide. Excellent post. I used to be checking constantly this blog and I'm inspired! Very useful information specifically the last section :) I care for such info much. I used to be seeking this particular info for a very lengthy time. Thank you and good luck. In July, 1887, a credit application was heard inside the Clermont Warden's Court for any reef claim 200 yards west of Hurley's Dam, and also the 'Telegram' states: . Not only does a digger realize that it is quite possible he may find a good deal of gold with very little trouble, but, worse still, he knows he or she work quite difficult without getting any gold at all. On the Early days with the Peak Downs Field from "The Peak Downs Telegraph".